1. The original 16% VAT rate for manufacturing and other industries will be reduced to 13%, the current 10% VAT rate for transportation, construction, real estate and other industries will be reduced to 9%, and the existing tier of 6% rate will remain unchanged. To implement a larger-scale tax cut, both general benefit and structural tax cuts will be introduced, so as to ease the tax burden on manufacturing industry and small and micro-sized enterprises. To deepen the VAT reform, the current 16% VAT rate of industries such as manufacturing will be reduced to 13%. The current 10% VAT rate of the transportation industry and construction industry will be reduced to 9%, so as to ensure that the tax burden of major industries is significantly reduced. The existing 6% VAT rate will remain unchanged. Also, by adopting supporting measures such as increasing tax deductions for producer and consumer services, the tax burden of all industries will go down; and in our opinion, the VAT system in China will be further simplified in the foreseeable future. 2. The share borne by employers for basic pension scheme for urban workers can be reduced to 16%. To stabilize the current method of tax collection, local governments should not adopt practices that will increase the actual payment of small and micro-sized enterprises during tax reform. Implementation of phased reduction policy of rate of unemployment and work injury insurance will continue. To reduce the current 16% VAT tax rate to 13% in manufacturing and other industries. To reduce the current 10% VAT tax rate to 9% in the transportation, construction and other industries. 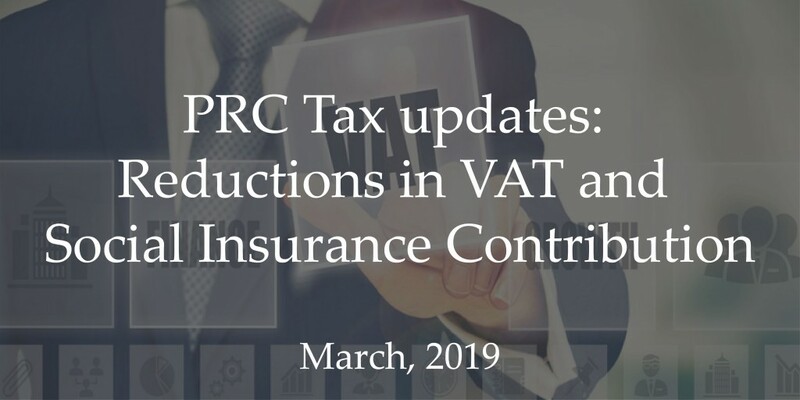 The existing tier of 6% VAT rate will remain unchanged, and adopt measures such as increasing tax deductions for producer and consumer services. To reduce the proportion of employers’ contributions to the basic pension scheme for urban workers, which can be reduced to 16% in various regions. To stabilize the current method of tax collection, local governments should not adopt practices of increasing the actual payment of small and micro-sized enterprises during tax reform. To grant a fixed tax rate reduction within three years for all types of enterprises that employ poor people from the rural areas and urban residents who have registered unemployment for more than six months. To implement the newly revised Individual Income Tax Law so that approximately 80 million taxpayers can enjoy the benefits.